The Michigan By Rail team is hard at work bringing together key stakeholders throughout the West-East rail corridor who support a new passenger transportation feasibility study between Holland and Detroit, via Grand Rapids and Lansing. Over the past few weeks, the number of supporters who are contributing match funding and letters of support has been growing from all corners. From our Mitten’s west coast to its east coast, more and more are coming out in support. With that, we would like to start thanking each of the project’s supporters one-by-one for pitching in. As each one of you steps up with your letter or your match contribution, it gets our state one step closer to re-establishing passenger service between our west and east coasts. Whether you helped out a little or a lot, it will make a huge difference when Michiganders are once again able to travel to and from Holland, Grand Rapids, Lansing, Detroit, and many in between, all by train. After all, as many of you have said to us yourselves – you can’t wait for the day when we can travel throughout our state, and get work done, simply read a book, or perhaps catch up on sleep, all as we go. This week, we extend a very fond thank-you to The Right Place from Grand Rapids, Michigan. The Right Place is a regional non-profit economic development organization, spearheading initiatives to stimulate economic growth, wealth creation, and business development in the West Michigan community. They are focused not only on innovation, but also the retention and creation of quality employment in the region. Thanks for your support! 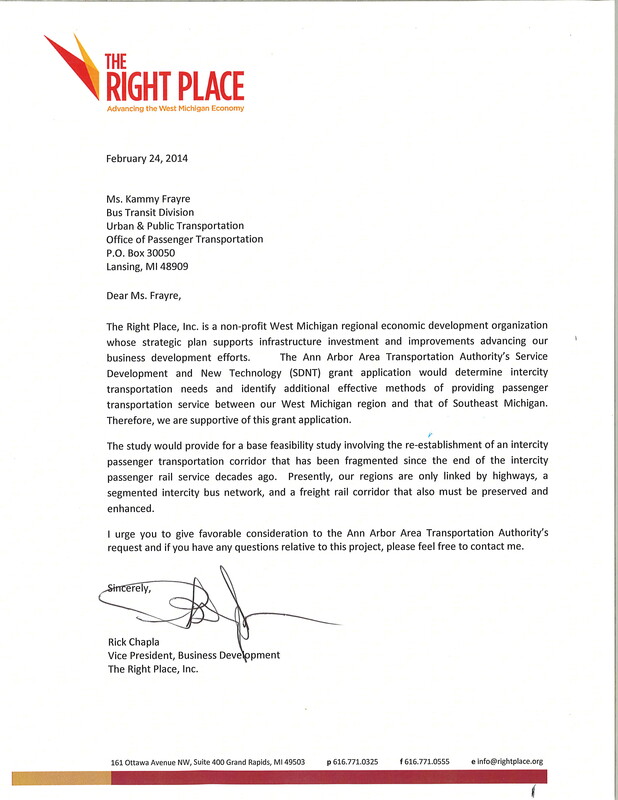 Below is a copy of their letter of support for the Ann Arbor Area Transportation Authority’s Service Development and New Technology grant application, to fund the study.